This is an illustration of WWW. 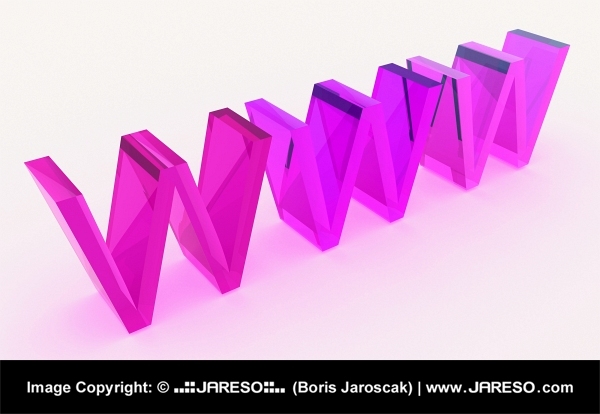 Three letters of World Wide Web that you would enter before typing in the name of the address of the website that you want to browse. The letters are big, bold and they appear to be made of translucent pink glass because you can see right through them. The 3D letters sit upright on a white surface with a plain white background. Looking below the letters you can see a hint of a light pink glow from the shadow of the 3D figure. When looking closely at the structure you can see that all 3 W’s are a different shade of pink. By clicking on the keyword(s) or keyword phrases you can start searching for other thematically similar graphics. Would you like to use this thumbnail graphic with the maximum size of 600x414 pixels on your web site and online projects for free of charge? You can do so without any worry and completely legally. The only prerequisite is placement of an active (clickable) link back to this site (jareso.com) somewhere on your website where this photo will be used. By downloading this free lower resolution image in the thumbnail size of 600x414 pixels you absolutely agree to use it in comply with copyright law and required rules.